Franklin Elementary School plans to hold two community events in celebration of the renovations at the historic school, 2627 E. 17th Ave., in south Spokane. 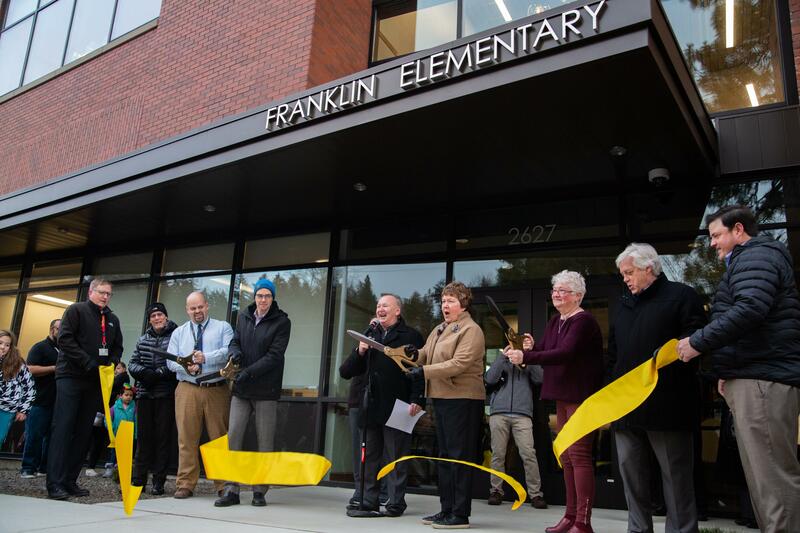 Jan. 16: Building dedication, 8:45 to 9:30 a.m.
Jan. 19: Open house, 10 a.m. to 1 p.m.
Nearly every student at Franklin Elementary School was uncommonly eager to head back to school after the winter break Monday as they streamed into their renovated school for the first time. They even showed up early and braved a chilling wind with their parents for a ribbon cutting at 8:15 a.m.
Construction on the 110-year-old building lasted a year and a half while students in the APPLE program that calls Franklin home met at “Camp Franklin” at the old Jefferson Elementary at 37th Avenue and Grand Boulevard. Franklin Elementary is on the National Register of Historic Places. Several school board members were there for the ribbon cutting, including Sue Chapin. Hollingsworth said the heat in the old building didn’t always work, and there was no air conditioning. “It was kind of a maze to get anywhere,” he said. Designers restored the historic section of the building, but didn’t try to copy it in a new wing that replaced a torn-down section. “They wanted to make it complementary,” said district spokesman Brian Coddington. The $26 million project was paid for by a bond approved by voters in 2015. The new 36,000-foot addition and the historic building add up to 75,000 square feet. There’s a cafeteria with a stage that can be used as an auditorium, but the gym is separate. The kitchen was designed for scratch cooking. “It’s a production kitchen, not just a warming kitchen,” Forsyth said. Director of Nutrition Services Doug Wordell said the kitchen includes convection ovens that can also work as steamers. “This one piece of equipment replaces three or four pieces of equipment,” he said. The kitchen is compact but designed for efficient cooking, he said. The second-floor library has floor-to-ceiling windows overlooking the play field and has rows of 36 computers for students to use. The old computer lab had 14 computers crammed into a small, windowless room, Forsyth said. “Now they come to this,” Forsyth said. They say every historic building has at least one quirk and Franklin Elementary’s quirk is the elevator that sits between the historic school and the new addition. Those inside it see six buttons – B, BH, 1, 1H, 2, 2H – even though there are only two stories and a basement. That’s because the first floor in the historic building isn’t on the same level as the first floor in the new addition. The classrooms all boast smart boards and smart projectors. The playfield was regraded and new sod was put down. The blacktop behind the school was replaced, the parking lot was increased in size and a mini-amphitheater that can be used for outdoor learning was put in behind the school. The children who came to school Monday all got tours of the building so they can learn their way around. Hollingsworth said he enjoyed how excited everyone seemed to be. Published: Jan. 11, 2019, 5 a.m.